With nine consecutive #1 albums to his credit, Jimmy Barnes is one of Australia’s best selling and most popular recording artists. 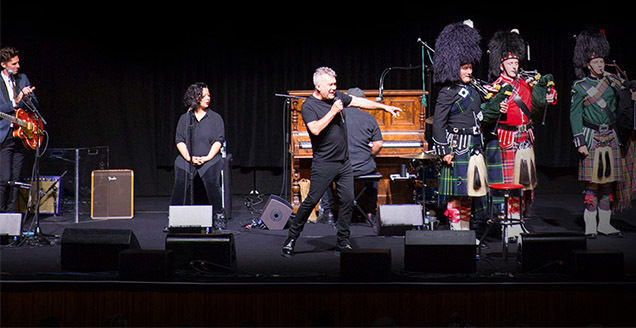 But there is more to Barnes than merely being the front man of Cold Chisel, one of the country’s best rock bands, or a successful solo artist, much of which may surprise even his fans. This revealing, heartfelt, raw and painfully honest documentary about Barnes’s troubled childhood and how he overcame his dark past to become a legend of the industry, and the forces that shaped him into who he is today. Working Class Boy is based on the singer’s own revealing autobiography which was published in 2016 and which went on to sell over 250,000 copies. It also draws upon the subsequent stage show of the same name in which Barnes took his history and his music to audiences both here and in his native Glasgow. Barnes was born James Dixon Swan in the tough working-class city of Glasgow in 1956. He was raised in a tough neighbourhood shaped by poverty, famine, alcoholism and domestic violence, sensitive issues that struck close to home. His father was a boxer who was frustrated by his lack of success. In the early 60s the family emigrated to Australia in the hope of finding a better life. After some time spent in a migrant detention centre, the family settled in the suburb of Elizabeth, outside Adelaide, a suburb that housed many other newly arrived migrants. But far from an idyllic existence, their home in Elizabeth became a house of horror, shaped by violence, drunkenness and abuse. The teenaged Barnes found salvation eventually through music and the love of a good woman (his wife Jane) who helped calm his personal demons. In recounting his upbringing, Barnes doesn’t shy away from the ugly realities and he hits a raw nerve with some of his painful recollections. He also speaks honestly about his relationship with his step father Reg Barnes, whose surname he took, a man who married his mother to try and provide some stability and a safe environment for him and his siblings. The film is structured on two levels – one sees him relate his personal story and revisit some of those woebegone places of his youth, which stirs up some traumatic memories and psychological scars. The other part of the film focuses on the Working Class Boy intimate acoustic stage show. The structure of the live show is similar to that of Springsteen on Broadway, in which the performer draws upon his recent autobiography and shares a few anecdotes which are illustrated by the choice of songs. Springsteen’s intimate show is more upbeat as there is none of the darkness of Barnes’ backstory. But this is not your typical music documentary – there is no chronological listing of the string of hits or the story behind his chart toppers – and, for fans of the man’s music, there is a lack of big hits for the soundtrack. There isn’t even his signature tune. But the music choices highlight and showcase his r&b influences. Songs like The Dark End Of The Street resonate strongly when juxtaposed with stories of his tough upbringing in Glasgow. There is a brief reunion with former Cold Chisel bandmates Ian Moss and Don Walker, who admit that they were largely unaware of Barnes’ tragic backstory. And he even duets with his son David Campbell, whom Barnes fathered as a teenager and who was largely raised by his grandmother. He tells us how reconnecting with his son was one of the more cathartic moments of his life. Working Class Boy has been directed by veteran filmmaker Mark Joffe (who has lots of film and tv credits including Spotswood, and several episodes of the tv series Jack Irish, etc), but he is constrained by the demands of the stage show itself and the source material. His direction is unobtrusive and workmanlike and he wisely lets Barnes tell his story his way. During some of the interviews he seems quite relaxed, but during those scenes where he revisits the places of his youth he seems understandable edgy and uncomfortable. The concert footage itself is shot in straightforward fashion without the usual frenetic editing or flashy camera work. Joffe himself was inspired by music documentaries like No Direction Home, Martin Scorsese’s excellent documentary about Bob Dylan, and the concert film The Last Waltz. There is also some carefully integrated archival footage and interviews with family members and childhood friends that add detail and texture to the story. While not terribly cinematic in style, Working Class Boy is a must see for fans of Jimmy Barnes as it reveals more about the man behind the music and shows us how he became the man he is today.